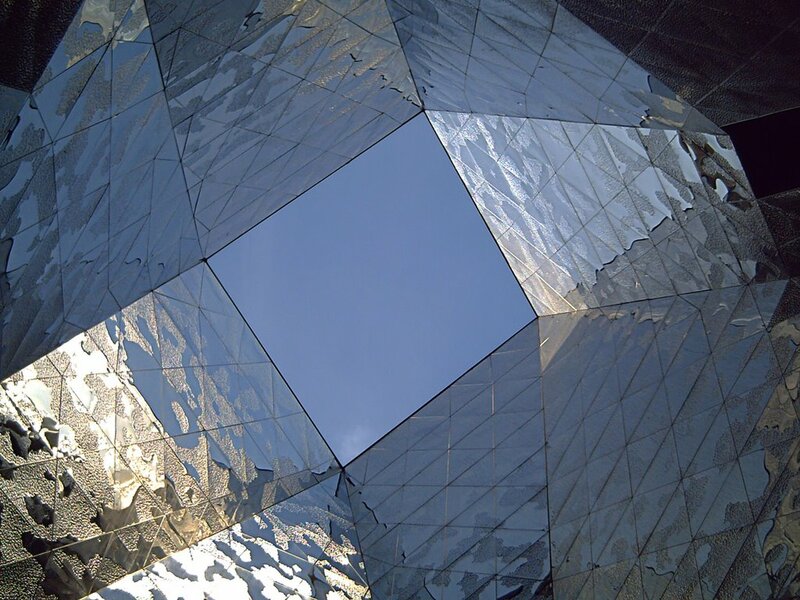 If you visit the Barcelona Forum building (posted last April 20th) don't forget to step right under this beautiful light shaft with silver reflections bringing daylight to the lower gallery. 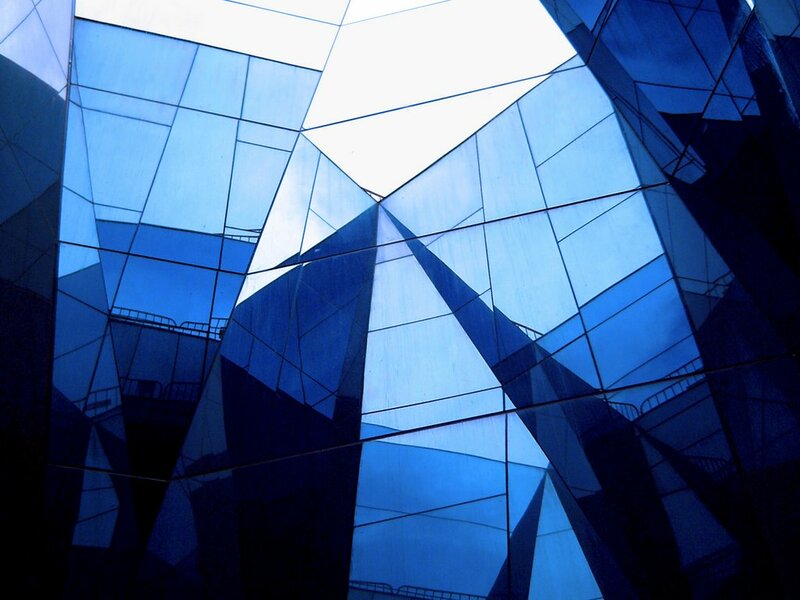 Or maybe you prefer blue reflections as the ones in this old picture of mine taken a few meters away. These could have been just plain shafts but as you see aesthetics and practical design are not antagonical. Last but not least, remember that a virtual tour or a view of the big solar panel were also featured back in April this year. 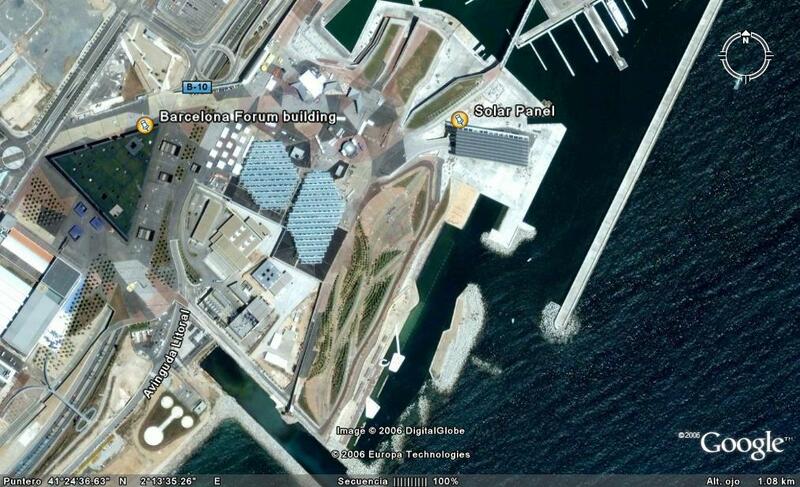 Google Earth Satellite View of Barcelona Forum premises. I know it might sound so simple to say, but this really is a beautiful shot with a great framing perspective. Um..i like the composition of this photo. :) the sky looks like one part of the building. Again, Carlos, you have a stunning and unusual photo! Conseguiste meter el cielo en polígonos, capturarlo, dimensionarlo, reproducirlo, tenerlo. Y el azul te sedujo compañero. Te comento ke me inscribi en barcelona photobloggers, pero aun no he podido ir a la expo en Fotonauta. Carlos, all I can say is this: I love the shot! in the middle. This one with the twisted square suggesting a diamond was my favorite. Jing: that's what of the things I like too. Thanks. Thanks Kate for your comment..
Zsolt: I reckon it is somewhat illusive. Thanks for the appreciation. Irredento, gracias. Esta mañana he visto tu foto en la sección fotoblogeando. Se llamaba "my girl" si mal no recuerdo. Buena foto desde Plaza Catalunya. Fabrizio, grazie. Il mio piacere. Harlequinpan, thanks you. Those artistic aquarels of yours should be admired by many dpbloggers. tr3nta: thanks for your visit, welcome. Thank you Edwin, I am flattered. Carlos I like your reflections ! Hi Carlos, thanks for your very nice comment on my blog! Perfect photo! When downloading, I expected to see your reflection too. Thanks GiuCe, Selana and Felicia. You are comments make me happy. Great graphic qualities to this picture Carlos. Thanks Curly. I was about to go to sleep but it is good to go with one extra comment. Thanks.